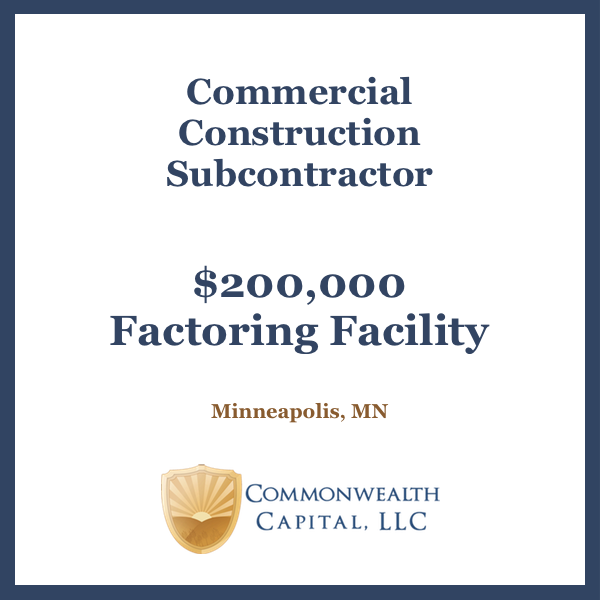 Commonwealth Capital is pleased to announce that it has funded a Minnesota-based Apparel Distributor through a $200,000 invoice factoring facility. The Company, which had been self-financed, had recently received a large order from a Big Box Retailer. The order was roughly equal to the Company’s previous year’s sales. Commonwealth Capital today announced it has provided a $700,000 invoice factoring facility to a Food Processing Company in the Upper Midwest. Commonwealth was referred to the Company by a community bank, which is providing the Company with a large line of credit and cash management services. There are conflicting reports on the availability of credit to small businesses. Here I take a quick look and get lost in the fields of data. I came across two articles today taking polar opposite views on small businesses and their access to credit. $350,000 Invoice Factoring Facility Provides Working Capital to Meet the Company’s Cash Needs.